Some of my friends collect volumes of The Best Writing on Mathematics published by Princeton University Press. The first annual volume appeared in 2010. 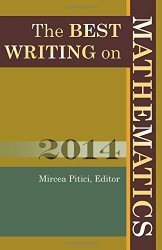 In 2014, one of my papers, Conway’s Wizards, was chosen to be included in the volume The Best Writing on Mathematics 2014 . All my life I have hated writing. My worst grades in high school were for writing. I couldn’t write in Russian, and I was sure I would never be able to write in English. I was mistaken. I am a better writer than I gave myself credit for being. Writing in English is easier for me than writing in Russian because when I make a mistake, I have an excuse. As my written English gets better and better, maybe one day I’ll get the courage to try writing in Russian. I would like to use this opportunity to thank Sue Katz, my friend, English teacher, and editor. Sue edits most of my blog essays. Originally I wrote about Conway’s wizards on my blog. When I had three essays on the subject I combined them into a paper. Sue edited the essays and the paper. I am honored to be included in this respected volume and I want to share this honor with Sue. Excellent! And congratulations to you and Sue.